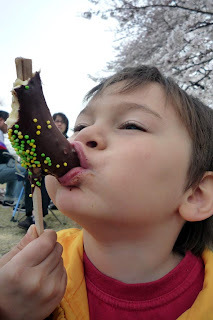 As soon as Ebi-kun spotted the choco banana stand, he had decided what he was having for pudding before he had even thought about lunch :o). 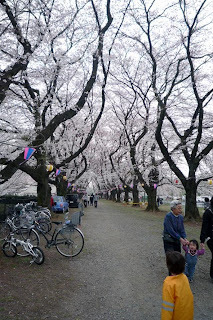 We hadn't taken taken anything to play with, often the hanami spots are really crowded and you are lucky to find a spot to sit down, let alone kick a ball around, there was space to play here, we know now for next time. Ebi-kun managed to keep himself amused by playing with his socks! This kid hates wearing socks, so as soon as his shoes come off, so do his socks. He invented several sock games and made us join in, there was a lot of giggling and silliness, it was a great day. Yesterday, we went to check out tents, we have decided to do more camping this year, I used to camp a lot when I was younger and love the idea that you can just throw everything in the car and go. Some campsites have tent or cabins for rent but you have to pre-book which kinda defeats the object. The problem is, we are clueless about tents. We are looking for a 5 man with a screened porch, this looks like a sensible family tent to have. The only 3 brands we have seen so far are Captain Stag, Coleman and Logos. I know of Coleman and my old tent was a Coleman, it was great but Coleman is the most expensive of the 3! If any of you have tent brand advice I would love to hear it. 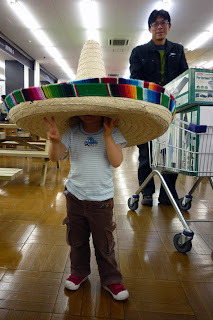 We settled on sleeping bags for now, Ebi-kun fancied this hat too, didn't come in his size LOL. With all this talk of camping, I thought we really needed a camp blanket, or even a camp quilt. I am not a big fan of quilts, I find them to be a sensory overload, all those colours and patterns, just too much. Take Anna Marie Horners quilts, I LOVE her fabric, the colours are fab but for me, this is too much, I get dizzy looking at it. 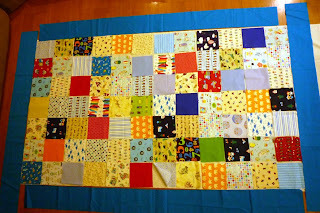 On the other hand, I would love a quilt like these - the rainbow lollipops and garden party quilt. So, I decided I needed to reduce my scrap pile and that I needed to make a camp quilt (inspired by the lovely Sycamore Stirrings). When my friend Kym left Japan she gave me loads of stuff including some quilting goods, so I have decided for my first attempt, to only use things from my stash and since my slave girl, erm I mean cousin was up for the weekend and I hate cutting, I had her cutting out all the squares - cheers Kirst! I now have 84 squares, a back and borders (which are in the wrong place on the photo - I have also switched some of the squares around since I took it) I also took the picture last night so the colours are not quite right. A great resource for all things camping is Backpacker Magazine. They have a wonderful website with lots of gear reviews and suggestions for newbie buyers. Good luck! !